The U.S.S. Enterprise investigates a remote area of space known as "The Delta Triangle" where starships have been disappearing without a trace for years. After a Klingon battlecruiser, the Klothos, disappears near the Enterprise, Kirk order his ship into the rift -- a "window to some other continuum" -- to investigate further. Soon, the Enterprise finds itself in a pocket universe, sailing in a Sargasso Sea of lost starships...some of which are ancient. The crews trapped there have formed a peaceful ruling council in this land, called "Elysium," and there are representatives there from many races, including Orions, Gorns, Phylosians and Tellarites. So far, none of these aliens have been able to return to the prime universe. And they punish any act of violence aggressively, since order must be maintained and resources shared in such a limited universe. Spock and Scotty realize that the power of the lost Klingon ship -- when combined with the Enterprise's own engines -- could propel them all home together. But first, the suspicious Klingons must agree to work with the Starfleet officers. And worse, one Klingon has violated the law of the land, meaning that the Elysium council is within its rights to punish the Klothos crew. 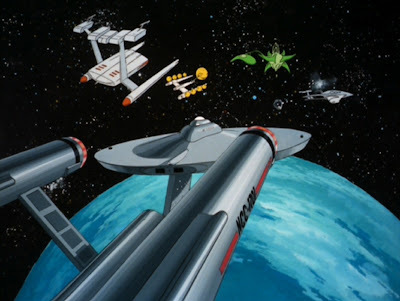 "The Time Trap" is another really terrific, really well-done episode of Star Trek: The Animated Series (1973 - 1974). In the tradition of the best Trek episodes, it offer trenchant social commentary relevant to its time, and even more than that, keys in on a popular "fad" of the 1970s: belief in the Bermuda Triangle, that region of the North Atlantic Ocean where many ships and planes have apparently vanished. "The Time Trap" is also splendid from a continuity standpoint, showcasing alien species we have already met in other episodes, including from "The Cage," "Journey to Babel," "Arena" and even "The Infinite Vulcan." Additionally, this episode sees the return of the Klingon Captain Kor of "Errand of Mercy." Unfortunately, the original actor, John Colicos, does not voice the character, which makes the return appearance of the beloved antagonist less successful than it might otherwise be. 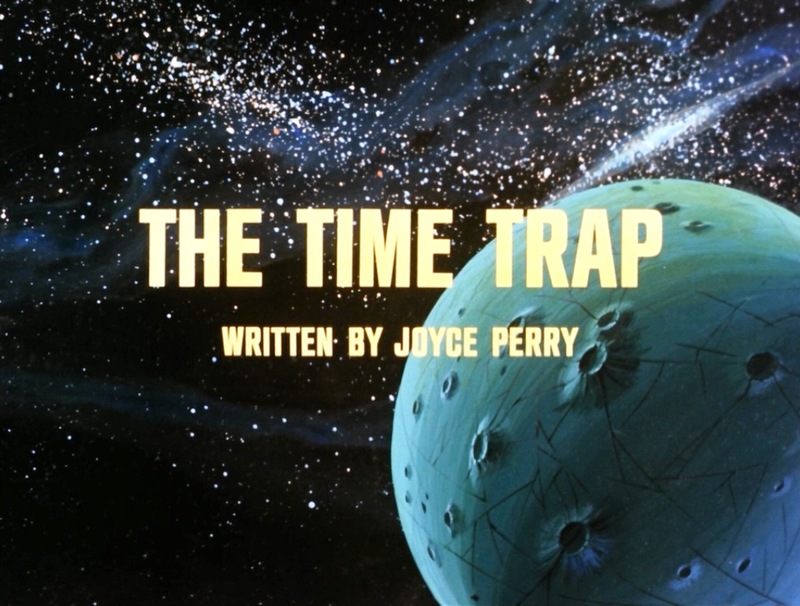 I interviewed "The Time Trap" author Joyce Perry back in the year 2000, and discussed this contribution to the Animated Series with her. Her Star Trek story is based on the very timely (in the early 1970s) notion of detente, a new era of cooperation between hostile or competing governments. "I had this idea that a Klingon ship and the Enterprise would get trapped in a Sargasso Sea of space and be forced to cooperate to escape," Perry told me. Perry's big concern was getting the former enemies out of the crisis. "I remember telling Gene [Roddenberry] this bizarre notion that two ships could combine engines and become more powerful as one than they were separately. I explained it with a straight face, but was afraid he might laugh me out of his office. Instead, he was quiet for about 30 seconds, then said 'that's pretty good...do it!" Regarding The Bermuda Triangle craze of the era, it probably began circa 1969 with the publication of a speculative book about that region called The Limbo of the Lost (by John Spencer). After "The Time Trap," series such as The Fantastic Journey featured story-lines in that mysterious region. But "The Delta Triangle" -- while clearly a transposed Bermuda Triangle -- works well for the Star Trek formula because it poses a trap that the Enterprise can't escape from alone, and thus suggests that enemies can become friends when faced with common problems. I especially appreciated the portions of the episode in which Kirk must go to bat for a Klingon who has broken the laws of Elysium. He realizes that if the Klothos is punished for the man's actions, the Enterprise won't be able to go home either. The Klingons and the Starfleet vessel need each other. Finally, Star Trek: Voyager (1995 - 2001) produced an episode in its seventh season, titled "The Void" that was very similar to "The Time Trap." In that story, Voyager slipped into a pocket of subspace where it found a Sargasso Sea of space ships, and their long-stranded crews. Next week: "The Ambergris Element." John excellent review of TAS "The Time Trap" episode. This is my favorite Animated Series episode. 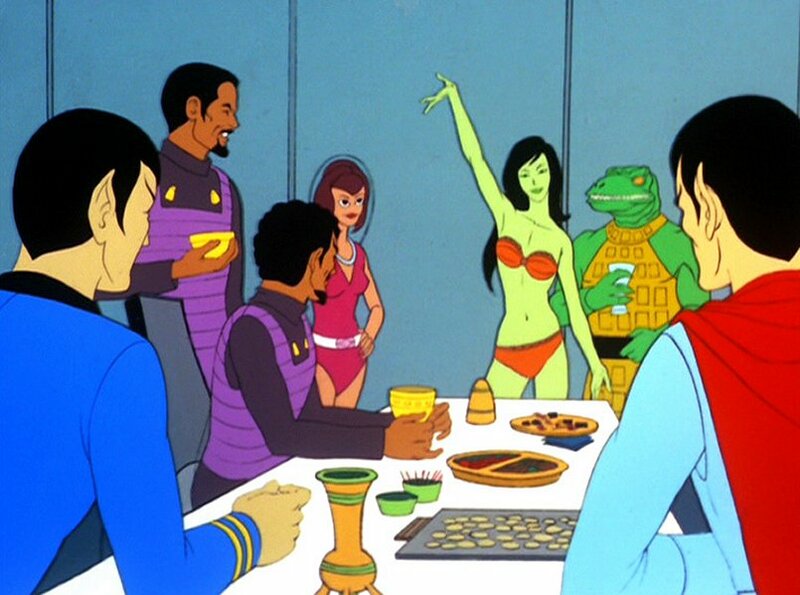 It could have been a live-action TOS episode. I always felt that "The Time Trap" would have been an excellent basis for one of the Kirk/Shatner Star Trek movies or the new Kirk/Pine Star Trek movies.